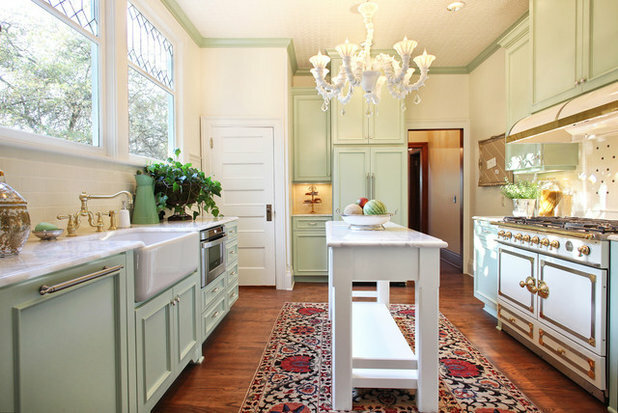 Do you long for a kitchen island but fear that your kitchen is too small to handle one? This may not be the case. 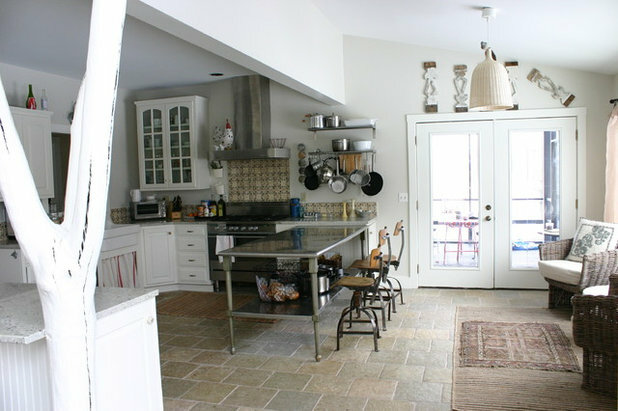 Like me, you may have had a large, clunky, massive image of a kitchen island in your head. 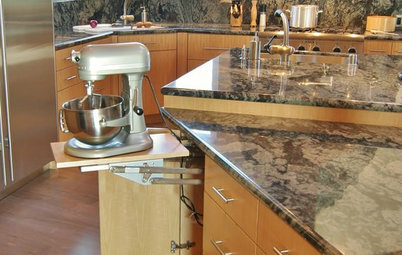 You see, yesterday I was checking out my friend Heather's new pad, and she mentioned adding an island to her kitchen. 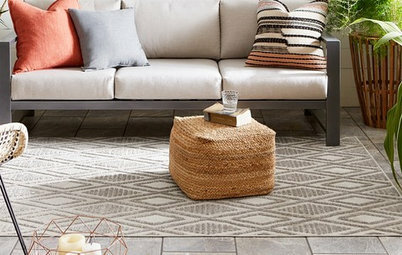 With the above-mentioned big island in my head, I thought she was a little nuts, but then I started browsing Houzz. 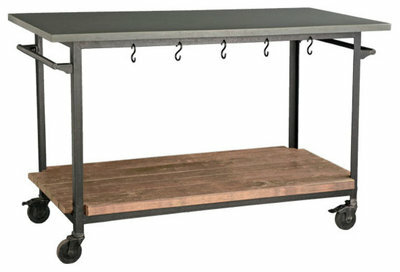 I stumbled upon a slew of islands that resemble tables and free-standing industrial counters. These models have a lot of advantages. While they don't have as many storage options as their clunkier island brothers, their open shapes take up less visual and physical space. 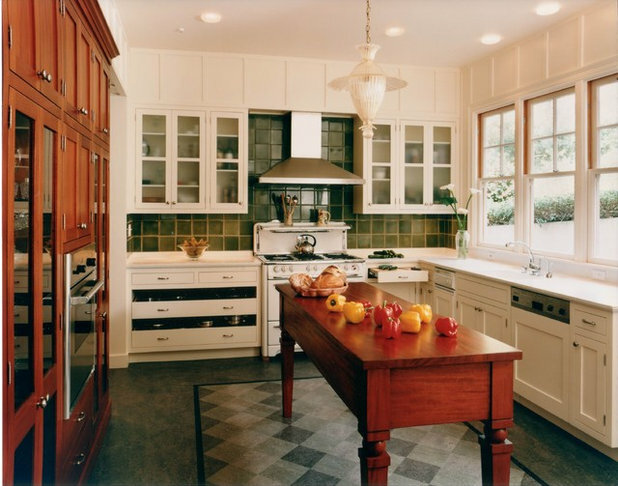 If all you really need is an extra surface for working and gathering, and perhaps an extra shelf, here are some options to consider for your kitchen. This kitchen is about the same size as my friend Heather's kitchen, and this petite and open island provides an extra prep surface as well as a shelf underneath. It's the perfect size for a small kitchen. 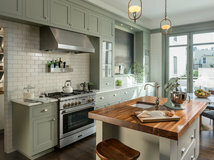 An island with metal legs and a laminate top keeps this kitchen light and airy, thus (the open shelves used in lieu of traditional cabinets have a similar effect). 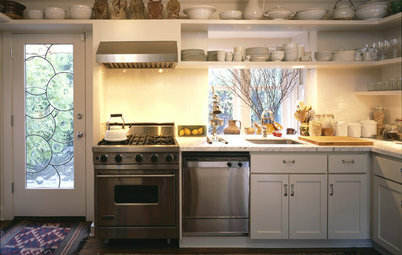 This is a great example of modernizing the cottage style. 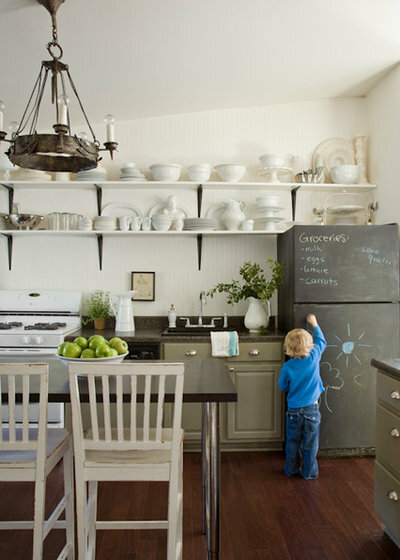 This table-like island has high farmhouse-table style, adding traditional lines and materials to a modern kitchen. 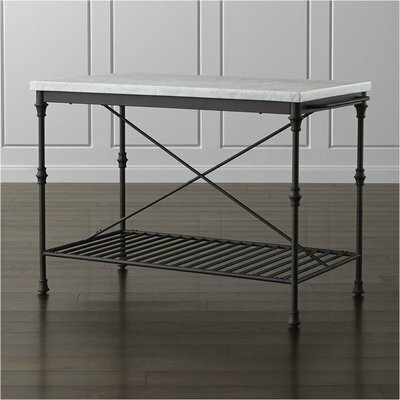 Technically, this is a kitchen peninsula because it's connected, but this piece could be used as an island and float wherever you want it. 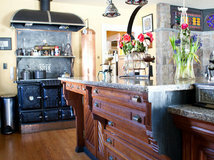 The metal finish adds commercial-kitchen style to this summer home. 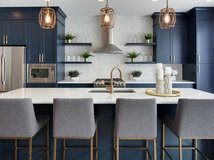 Kitchen expert Rebekah Zaveloff says "I love open kitchen islands for smaller spaces because you don’t need an extra overhang like you do when there’s closed storage...I love the easy access to everyday salad bowls, pots and pans." 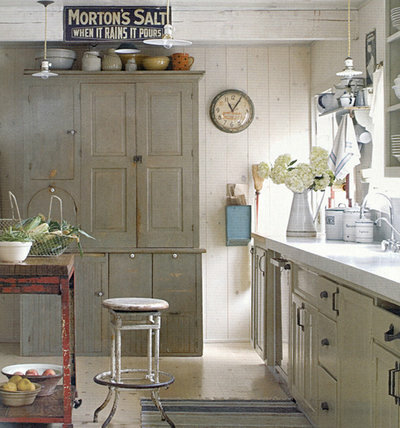 This vintage cart adds character, patina and personality to this kitchen. This designer has done a great job of using just the right number of vintage objects, such as the enamel Morton's Salt sign, vintage clock, counter stool and cart. 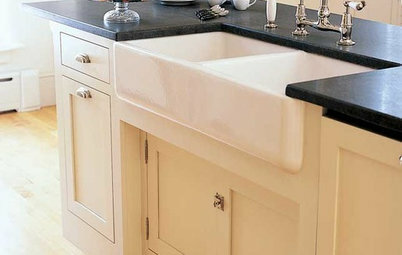 These items add the right balance of well-worn character into the light kitchen, without stepping into vintage overload. This island had some drawers for extra storage and still keeps a more open feeling. I like the contrast of the blue paint with the rich reclaimed wood. 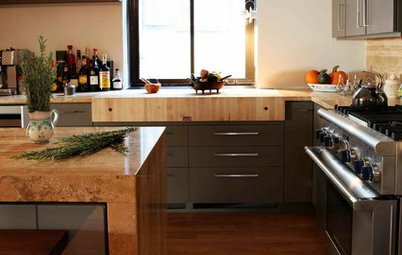 This island is perfectly scaled to fit in the long but narrow kitchen. 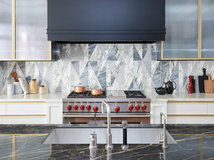 A good test for gauging measurements and placement is to open your oven, dishwasher, cabinets and refrigerator to make sure there is enough clear space in the center of all of them. Next: I've found a few free-standing islands for you to consider. Keep in mind that you also may opt to have one custom made. 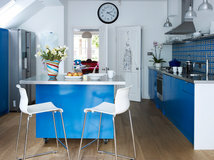 This island has great vintage-modern style. 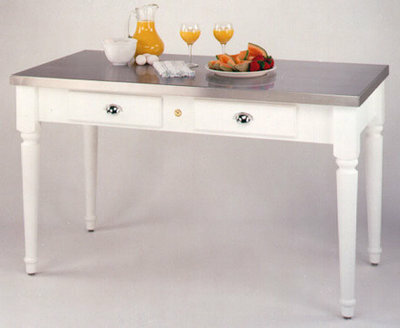 It will fit right into a more traditional kitchen and will add some character to a more modern kitchen. 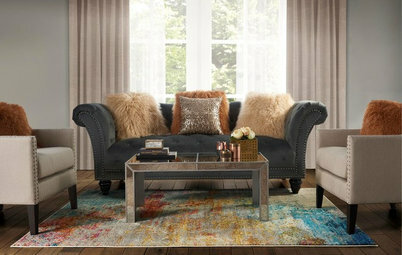 This is a more rustic industrial vintage-modern island. 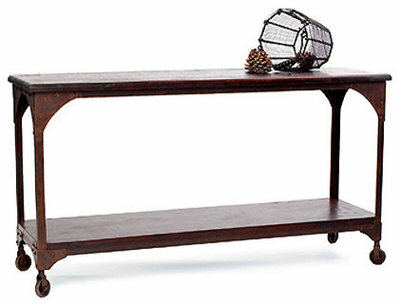 The casters make it a versatile piece that you can use as a sideboard in the dining room or as a bar on the deck when you have guests. However, if your parties are anything like mine, you'll need to keep it parked in the kitchen, because everyone will wind up gathering around it in there no matter what you do to lure them to other rooms. 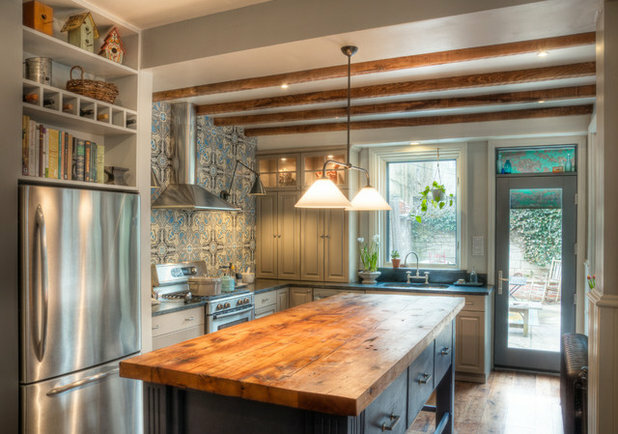 One great thing about islands is that the counter tops do NOT have to match the rest of the counters in the kitchen, and butcher block is a surface that fits into any kitchen. This island is somewhat similar to the previous one. 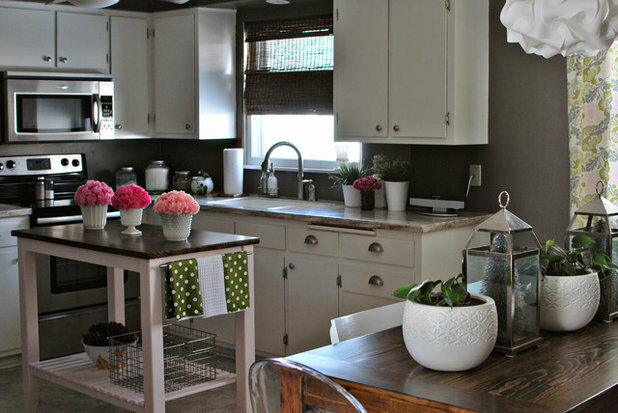 The difference is that you can tuck counter stools underneath it. In a tight space, this can make a big difference. 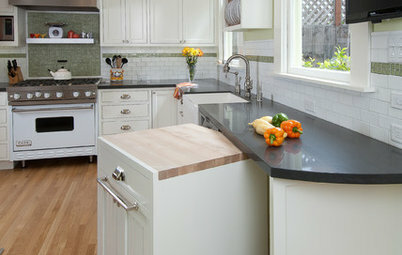 This island adds commercial kitchen style. With the current proliferation of shows like Top Chef, this is a trend that's here to stay for quite awhile. 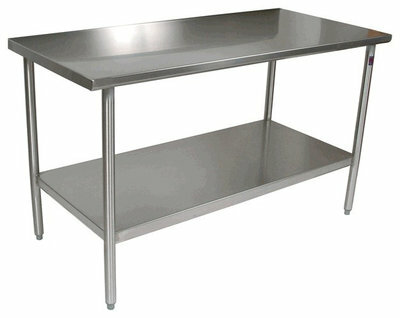 This one is somewhat similar to the one above, with some added industrial character and portability. By the way, you can lock these wheels in place once you find the perfect spot for it. 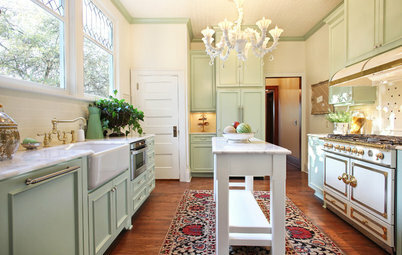 This island will add sophisticated country charm to any kitchen. 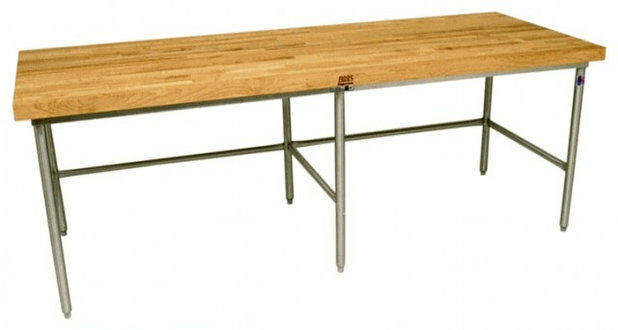 It will also fit in well with a Scandinavian-inspired kitchen. 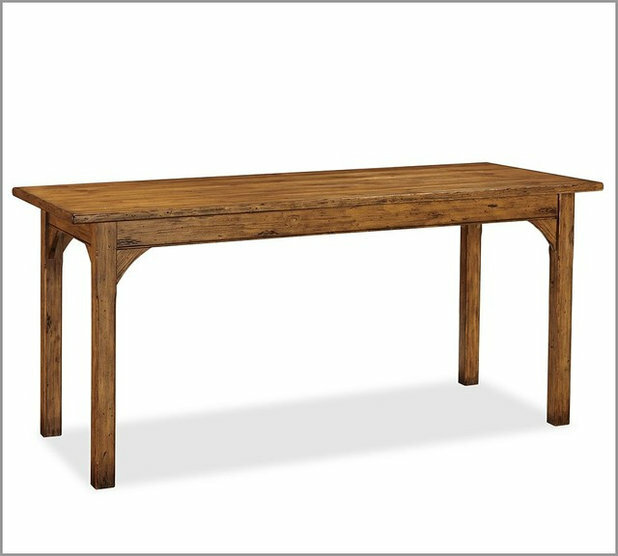 This style is similar to the one in the first image of this ideabook; it's a farmhouse table with extra height, and adds a bit of tradition to any style kitchen. 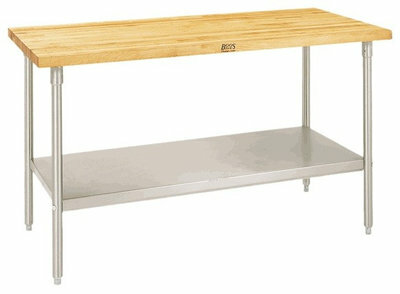 I have an IKEA butcher block "island" that works great in my small kitchen and the warmth of the wooden top is a plus. Don't forget that Catskill makes wonderful sturdy islands with many sizes to choose from. An old sewing table (no drawer type) from garage sale works wonders and place a large cutting board on top. You can store things under it such as a nice basket with a lid and fill it with appliance not used often or recyleables. on several kitchen renos i opened all the "large" doors, oven-fridge-dishwasher, then taped out the remaining area and set ordinary boxes within the taped area. after working in the kitchen for a few days with this faux island, i was able to build the perfect sized islands in all 3 cases. 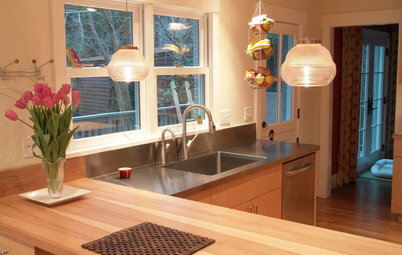 in two instances the kitchen was the selling point of the home. you can go as big or as small as you like, however at 6' tall i find the biggest is best = less walking, easier reaching of utensils, etc.